Don’t you hate not having a seam ripper or screwdriver (or needle threader or safety pin) when you need one? I never know what tools I’ll need when I teach, monitor, or take classes, so I’ve gathered together some items I need most often and put them into a small plastic tube (about the size of a soda can). It fits easily into my project bag or suitcase, and keeps my tools from getting jumbled in with my sewing notions and supplies. Here’s a peek at what I have in my little “sewing tube” right now. I taught several overlocker/serger classes last month, so there might be a few items that are unfamiliar to you. Tip: Mark all of your tools with colorful duct tape. Asking “Has anyone seen a seam ripper (screwdriver, needle threader, etc.) with pink duct tape on it?” usually results in the return of the missing item without the need for a detailed description. How do you carry your sewing supplies to classes? 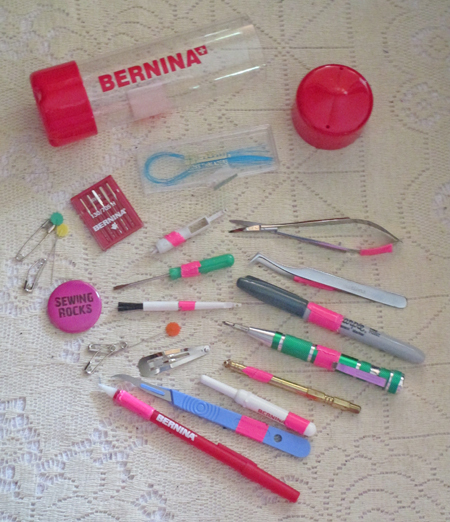 Where can O get a Bernina tube? I use a snap-shut hard cover eye glass case to transport my mini sewing kit. Works great and is solid. Holds a fair amount of stuff too. Love this idea and even better…I have those storage tubes on hand to put together my own kit. Thanks! !